Performers include: Melanie Baker, Shannon Farnon, Joan Gardner, Kathy Gori, Jackie Earle Haley, Don Messick, Alan Oppenheimer, Andrew Parks, Mike Road, and Frank Welker. Science teacher John Butler (Mike Road) embarks on an expedition and it turns into a trip that he and his family will never forget. John is joined on the trip by his wife Kim (Shannon Farnon), children Katie (Kathy Gori) and Greg (Jackie Earle Haley), and their dog Digger (Frank Welker). While rafting down the Amazon, their boat hits a rock and capsizes. They are then sucked into a whirlpool which pulls them through an underground cavern. They resurface and find that they’re in a strange prehistoric valley — complete with cave dwellers and dinosaurs. They meet caveman Gorok (Alan Oppenheimer) and become friends with him and his family. Gorok’s mate is Gara (Joan Gardner) and their two children are Lok (Frank Welker) and Tana (Melanie Baker). They also have a pet, a loveable dinosaur named Glump (Frank Welker). 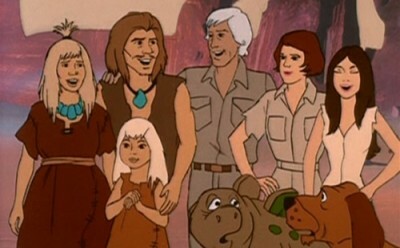 Narrated by Don Messick, the series shows the two families working together with Gorok and his kin helping the Butlers try to find a way home while learning how to survive in the strange valley. Riding atop prehistoric camels, the Tamur tribe returns to the valley for a raid. They are blocked temporarily by the debris from a landslide. John has developed a drill that is capable of bringing oil from the earth that can fuel torches and scare away the Tamurs. Meanwhile, Katie is having problems with a baby dinosaur she calls Funny Face. The Butlers decide to use him to turn the drill. Unfortunately, Funny Face’s mother comes along so the Butlers and their friends must turn it themselves. Just in time, the torches are successfully lit and drive the raiders away. First aired: December 21, 1974. Young Jackie Earle Haley went on to roles in the Bad News Bears movies and then, as an adult, starred in TV shows like Human Target and movies like Watchmen and the remake of A Nightmare on Elm Street.